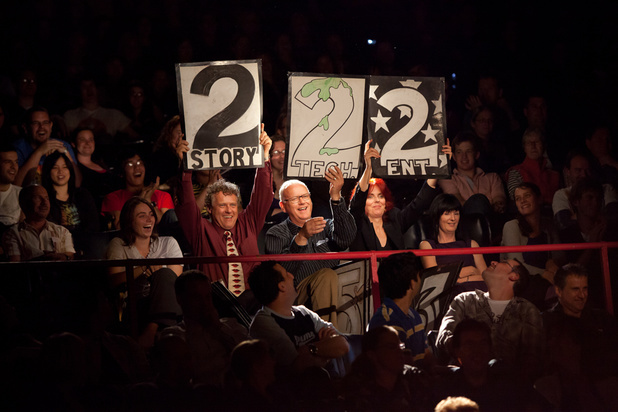 This year marked Impro Melbourne’s 26th annual Celebrity Theatresports. Four teams of Impro Melbourne players and celebrity guests battled it out for the Peter Cook Cup in a series of improv games, scored by a panel of celebrity judges. Host Russell Fletcher was amiable but daggy, giving off the vibe that he was hosting a variety night at a local RSL. This mood was amplified when one of the guest judges of the night was announced to be Santa. He’s not busy at Easter, you see. The show was very family-oriented, with mint chews being whipped at the audience at regular intervals to keep everyone on their toes. The performances of the celebrities were hit and miss. Those with comedic experience (Lawrence Mooney, Toby Truslove, Scott Brennan, George Kapiniaris) got laughs and kept scenes moving. Chantelle and Steve from The Block were incredibly enthusiastic and seemed like they were having a great time. A trio of actors from Neighbours, however, struggled with some of the games, leading to scenes that went nowhere. Despite the uneven performances, the audience was very supportive, no doubt enjoying seeing some of their favourite celebrities flailing about. As a fan of Impro Melbourne’s work throughout the year, I found Celebrity Theatresports lacking. It was disappointing that none of the new guard of improv players that appear during the season were performing on the night. The ratio of celebrities to improv professionals was way off in some of the teams. Tie of the Tiger had one player with three celebrities, which meant when things fell flat, it was difficult to turn them around. The jokes were tame and in some cases ancient (It has been a decade since Kelis released ‘Milkshake’ – let it go). However, my experience wasn’t representative of the audience in general. The families and kids in attendance were clearly having a great time. If you’re keen on seeing celebrities out of their comfort zone, you might get a kick out of Celebrity Theatresports. But if it’s quality improv you’re after, Impro Melbourne’s regular season is a far better place to get it.